Anders Behring Breivik is currently on trial in an Oslo District Court for killing 77 people. The mass murders sent shockwaves throughout the world. And now, prosecutors have offered more evidence to explain his motivation: between November 2010 and February 2011, Breivik played World of Warcraft an average of 6 hours and 50 minutes every day. According to Norwegian paper Verdens Gang, Breivik was angered by this connection and said, "It is not relevant to this case whatsoever." However, the prosecution is apparently trying to show that Breivik spent most of his time gaming and is lying about how much time he spent writing his manifesto and preparing for the attack. Earlier this year, Kotaku covered the virtual life of Andres Behring Breivik, who said at one point he spent an entire year playing Blizzard's massively multiplayer online role-playing game for 16 hours a day. A former World of Warcraft guildmate told Kotaku earlier this year that Breivik was "unremarkable", "socially awkward", and "not very opinionated". This isn't the first World of Warcraft link, and it's been a constant throughout the trial. In April, when the court case began, the prosecution displayed an image of his World of Warcraft character, Andersnordic. 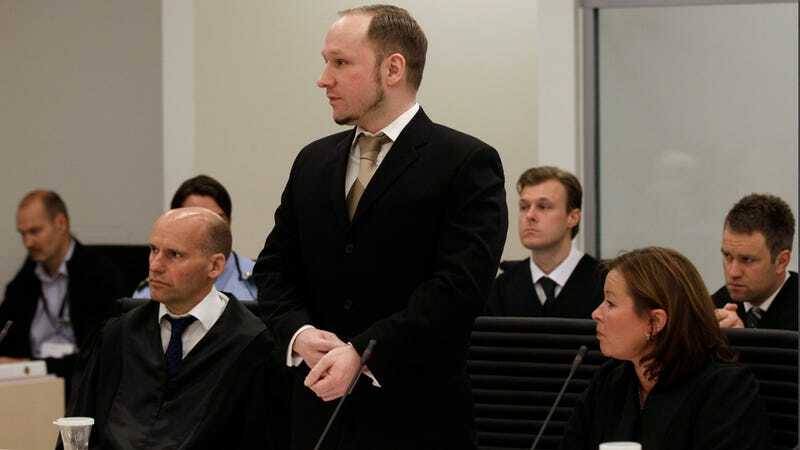 This latest assertion—connecting Breivik's average World of Warcraft gaming time to the mass killings—made him so upset that he threatened to switch off his microphone during the court proceedings.